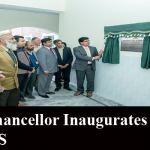 2-day International Conference on (RACR) begins at UVAS. The Department of Physiology of the University of Veterinary and Animal Sciences (UVAS) Lahore in collaboration with the Higher Education Commission (HEC), Postgraduate Medical Institute Lahore (PGMI) and University of Cambridge UK organised 2-day “International Conference on Recent Advances in Clinical Research (RACR)”in UVAS City Campus Lahore. Punjab Higher Education Commission Lahore Chairperson Prof Dr Mohammad Nizam-ud-Din presided over the inaugural session of the conference while Vice-Chancellor Prof Dr Talat Naseer Pasha,Dean Faculty of Bio Sciences Prof Dr Habib-ur-Rehman, renowned neurologist Prof Dr Ahsan Numan, Dr Sohail Ejaz and renowned academicians, clinical researchers, neurologists and physiologists from public & private practitioners and students related to veterinary & animal sciences, livestock and medical sciences related to public health while experts from different countries, including the United Kingdome (UK), Philippine, South Korea, Malaysia, Russia and all over Pakistan attended. Speaking on the occasion, Prof Nizam-ud-Din said that we have to focus on research especially in the area of clinical discipline which has been a neglected area in medical sciences. He said universities all over the world are known as the hub of research and research is called the backbone of the institutions. He said it is direly needed to develop a data base anddo analysis regarding agriculture and clinical research even in the production of medicines for human and animals especially medicine impact and its side effects on the human bodiesand animals for the prevention of diseases. Vice-Chancellor Prof Talat Naseer Pasha said that UVAS is focusing on result-oriented applied research, multi-level education and talent development by using its knowledge, resources and skills for growth of human resources and solving problems of allied sectors.He said that UVAS faculty members are executing 93 research projects of over a billion rupees won from the national and international funding agencies/organization. He said that the UVAS is working closely with Punjab government for the development of livestock and related sectors.He acknowledged therole of Punjab Food Authority and its step taken for the minimum pasteurization law to provide healthy milk and food to people. He spoke about UVAS facilities regarding diseases diagnosis, treatment and advisory services for the development of livestock sector in Pakistan. Prof Dr Habib-ur-Rehman spoke about the objectives of the conference. He said clinical research is an important branch of medical sciences that determines the safety and effectiveness on NOVEL medications, devices, diagnostic products and treatment regimens intended for human use at a stage when other available product fail. He said that the clinical trials are globally conducted for the prevention, treatment, diagnosis orfor relieving symptoms of a disease at a stagewhere other medications fail, hence giving a new hope of cure for the patients and opening a new horizon for the treatment of a disease and to improve the quality of life. The conference comprises on four technical sessions, six keynote, 11 oral and 50 poster presentations while four satellite workshopsincluding simulation techniques in drug development, meta-analysis and systematic review, role of RT-PCR in molecular diagnostics and blood and tissue sampling from laboratory mouse will feature in the two-day event. Theme of the conference will cover all the major areas of translational medicine and drug development, ethical concern in clinical research, meta-analysis and systematic review, handling of experimental animals and conduct of clinical trials etc.